Well, I guess I don't have to explain too much about the Spider-Man because of the massive amount of hype you can see thanks to the films. However, I must add that this is undeniably one of the finest, hardest and final games we SMS fans played. Put the cartridge on, (or load the rom... depending on the situation) and ready to play one of the last beauties of SMS while she was singing her swan song. Story seems kind of cliche at first: Kingpin, greatest criminal mind (disputed) of the Marvel, plants a bomb in New York City and pins the blame on good ol' Web-Head. 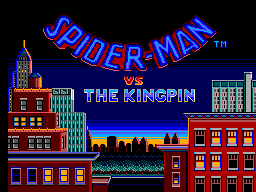 Spidey must venture through toughest parts of the NYC to capture the Supervillains(TM) working for Kingpin and retrieve the keys that needed to deactive the bomb. You have 24 hours to solve this crisis before NY becomes a one gigantic crater and Spidey goes down in history as the greatest psyco ever. Remember one thing though: Spidey, although a Superhero(TM.. again), is still a human being. He needs to rest time to time to keep fighting the bad guys. Time you spend in resting will be deducted from your overall 24 hour limit. Oh yes, there's that web-fluid thing. That stuff is not cheap and doesn't grow in trees. You must use Peter Parker's uncanny photographing abilities to take good shots of various supervillains and use the money to get yourselves some fluid for web slinging. Or else, you might end up hailing cabs or riding buses to get around the New York. Oh man, what can I say? A true feast... for SMS standards that is. A highly detailed backgrounds and character sprites will keep you company through the game. Some of you good players might even confuse what console you are playing. Many different types of enemies awaiting you in every different stage. My guess is you might fall in love with the backgrounds at Central Park. (4th Stage) Seriously, instead of fighting the bad guys, most of the time I was simply climbed as high as I can and kept slinging around to watch the beautiful New York night. If only that damn gigantic bat wasn't following me around, it would be a much better experience... I almost forgot, story is narrated through one of the best panel illustrations you can ever see in consoles similar the way in Phantasy Star IV. 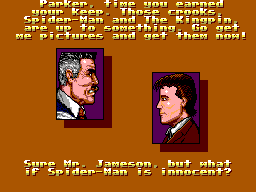 From the ever-angry face of J.Jonah Jameson to heavenly crimson haired Mary Jane, all important characters in Spidey's life seems to be included in the game's cutscenes. Uh... Well... Umm... There is not much to say... really. This is a good game and... Okay, okay. I'll tell the truth. Both music and sound effects are horrible. Horrible with a capital H! I played the games for so many times, I can't remember and I don't remember I played the game with the music on. Thankfully, programmers were also aware of this fact and put an in-game option menu. That way you can save your ears from the noises that called "BGM". No problems there. Most of the moves Spidey can pull off can be easily done with the Control Pad. In case you don't own the manual: you can cling to the wall with pressing up + button 2. You can open the options menu by pressing 1 and 2 buttons at the same time. 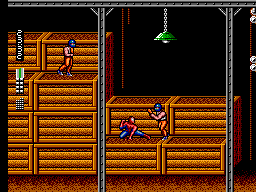 You can punch, kick or jump kick the bad guys. You can wrap them with your webs. By accessing the option menu and selecting the "Camera" icon you can take the ever-important pictures of the villains and earn some money. Just do me a favor and don't jump too high around the Power Station, okay?